Brothers is a supremely confidently-made game, almost arrogant; it takes huge risks at almost every level, pulls it off spectacularly every time, and then points triumphantly at its own success. This is a studio showing off exactly what they can do – the video game equivalent of winning a fight with one arm tied behind your back. It’s showy, but it’s hugely, breath-takingly impressive. The set-up is that two brothers decide to embark on a quest to retrieve a mystical cure for their dying father. The twist is that you control both of them – it’s almost like a co-op game that you play with yourself. Each brother is controlled by one half of your gamepad (despite the PC release, this is still a gamepad-only game, and justifiably so), and you must direct them both simultaneously through a series of platforming and puzzle sequences. Learning to play Brothers feels like learning how to play video games all over again. The simultenous control of both characters is seriously disorientating, like trying to rub your stomach and pat your head at the same time, and I’m not sure I was really comfortable with it even by the end of the game. Rather than frustrating, it’s incredibly novel. In so many games you’re simply applying the same long-ingrained skills over and over, no matter how different the specifics may be; in Brothers you’re genuinely doing something completely new and different, and adapting to that newness is an integral part of the gameplay. 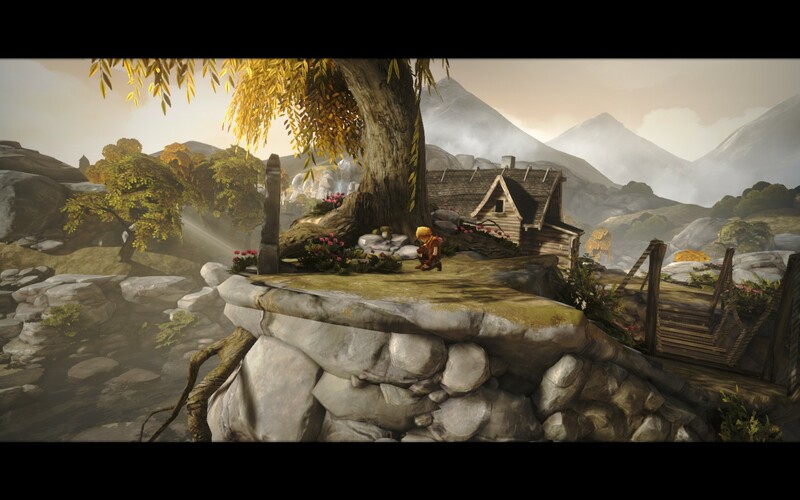 Platforming that would be rote becomes incredibly tense, requiring your utmost concentration. When you’re working out puzzles, you’re figuring out new elements of the control scheme as much as you’re deciphering the puzzle. The mechanics serve a purpose too – they’re not just a gimmick, they tie inextricably into the story and themes of the game. Controlling the brothers simultaneously both gives you an emotional bond with them, and establishes their bond with each other. If you were controlling one and escorting the other, the computer-controlled brother would become an annoyance, a burden – controlling both allows you to empathise with both of them equally. Without spoiling anything, the mechanics are ultimately taken in some unexpected and extremely clever directions, using your growing confidence with them to tie in to and enhance the emotional beats of the narrative. The connection between the way the game plays and the way the game makes you feel is seamless – one could not exist without the other. This is the medium at its best, telling a story in a way that only a video game could. What a story it is too. The setting is remiscent of Germanic fairy tales, a world that whose details are hinted at rather than drearily expositioned about. This gives the story a folkloric feel. Two brothers setting out on a quest to find a mystical cure-all, encountering magical beasts along the way – it certainly sounds like a classic children’s fantasy story. It doesn’t let itself go too far in that direction though, becoming too simple or too unreal – there are twists and turns along the way that subvert the expectations and tropes of those old tales, and ultimately give it a more grounded, mature feel. It’s a strongly emotional story, with some real gut-punches along the way – it certainly challenges that hoary old assertion that a video game can’t make you cry. The really impressive thing is that it manages it with no real dialogue. The character speak in a sort of Simlish-esque nonsense-talk – it’s a language they understand, but we as the audience don’t. They’re pretty simple, cartoony characters too, without that much fidelity to their animations or expression. To tease such a complex and touching story out of such harsh restrictions is truly amazing. Perhaps the most striking element of Brothers, however, is its visuals. This is one of the most beautiful games you will ever see. It is a perfect example of how good art design and skillful execution can completely trump the escalating-technology-and-‘realism’, throw-money-at-it approach of the average AAA studio. Every vista is breath-taking, in its scale and its imagination. 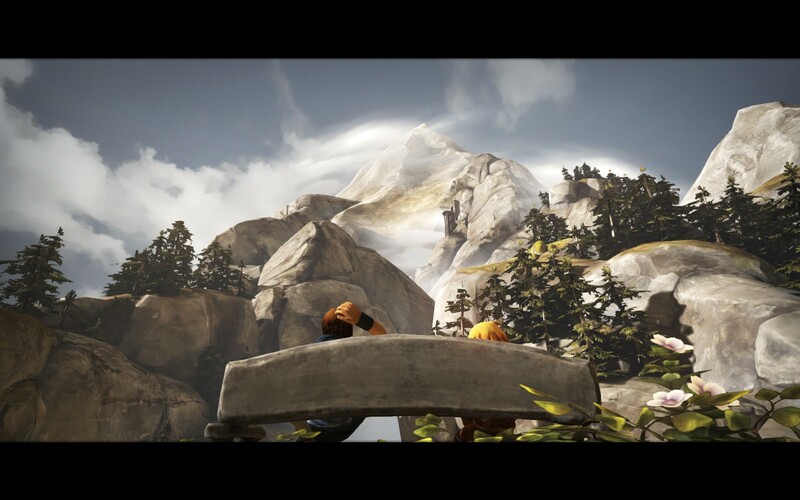 So confident were the developers in their art that the game is scattered with benches whose only function is that, if the brothers sit down on them, they give you a wider, better view of the background. Truly, justifiably arrogant – I came to think of them as ‘screenshot seats’. The shots I resultingly took don’t even begin to do the game justice. My only worry with Brothers is that I think it may have limited its own audience. I think the first impression it gives, in footage and descriptions, is of an ‘art game’, similar to something like Journey – something very accessible, especially for those who rate visuals and narrative above mechanics and systems. Typical these games don’t require you to develop your skills in the way that the average game does – Journey didn’t demand that you get increasingly better at sliding down sand dunes. 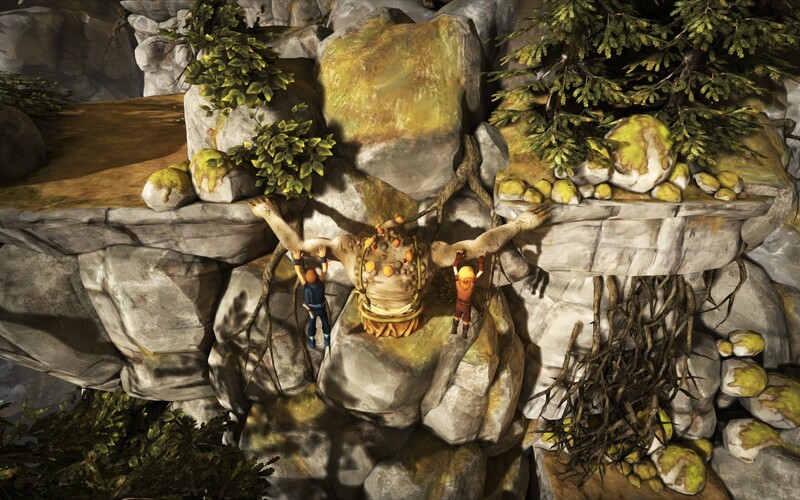 Brothers, on the other hand, is genuinely difficult, and the mechanics tie very strongly into the core experience. 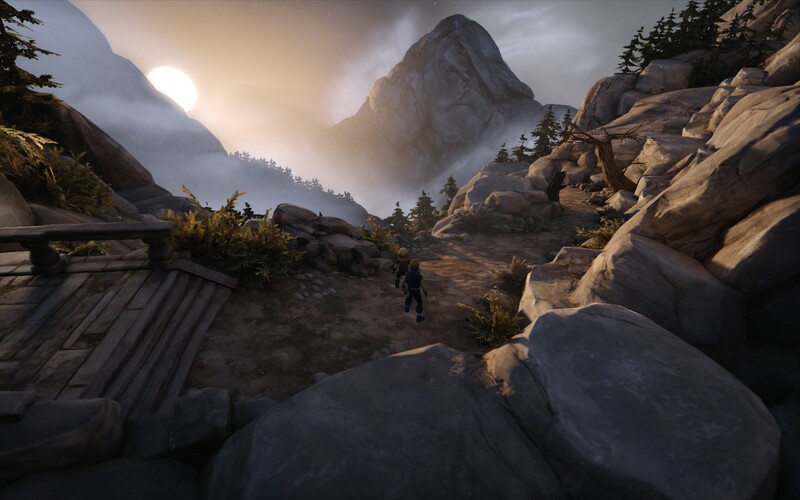 Even as someone who’s spent his whole life internalising gaming, I found Brothers very difficult to get my head around – I can imagine more ‘casual’ gamers becoming frustrated, or even being unable to complete sections of the game. I’ve sat non-gamers down to play Journey before and left them to it – I don’t think I could do that with Brothers. Not that I would advocate any dumbing-down of the mechanics; the gameplay, as it is, contributes hugely to what makes the game so incredibly special. I just worry that some may go in with the wrong expectations, and bounce off the game as a result. Brothers will only take you an evening or two to play through, but you will be utterly spell-bound throughout. Talent and passion shine through every aspect of the game. Maybe it is a little arrogant – but it really, seriously has reason to be.